I am way late getting on board the Minimates bandwagon, and from what I can tell it seems I'm not alone - the Ghostbusters Minimates seem to be selling very well, which suggests to me that it's attracting casual collectors as well as Minimate diehards (no doubt to their chagrin - I was lucky enough to score the Ray/Marshmallow Man 2-pack, while longtime Minimate fan Rustin Parr has yet to find one). In general, I've never been very interested in "non-realistic" action figure lines - block figures, vinyl figures, and so forth. It was only my resurgent interest in Ghostbusters, along with a strong recommendation from the aforementioned Mr. Parr, that got me to consider picking up a set. 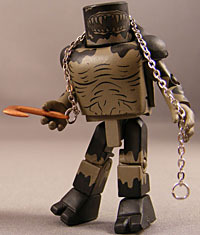 Of the various block figure formats, Minimates is probably the one that had the best chance of appealing to me. They have more unique tooling, accessories and articulation than Kubricks (and run a lot cheaper). To make a long story a bit shorter, I now own every Ghostbusters Minimate released so far. I've played through Ghostbusters: The Video Game a few times now, so I'm pretty familiar with the four ghosts from the four-pack, but even if you're not, it's always cool to get more bad guys. The figures come in a blister pack that allows full view of all the characters. This is the same style used for the Series 1 four-pack, rather than the larger cardboard boxes that the Marvel figures come in. I should mention, I really like the way the logo turns the "No Ghost" symbol into a Minimate, and it'd be great to get that as an exclusive figure. First up is Azetlor, a.k.a. "the Collector" - fun fact, it was Azetlor who murdered Eleanor Twitty, the library ghost from the beginning of the first movie. Azetlor is about 20 feet tall in the game, so he's not quite in scale here. His body is clear to represent the fact that he's mostly a collection of floating parts pulled from the environment. 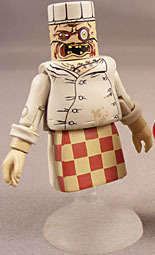 The figure's head is taller than the usual Minimate's, to allow room for his starfish-shaped face. 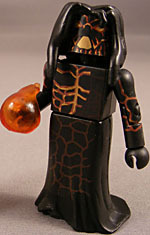 While it's neat to have a semi-clear Minimate, I definitely think Azetlor is one of the weaker figures of the set. Next up is the Architect, whose real name I won't divulge so as not to spoil the game for you. I can tell you, however, that he's not even remotely close to scale. He's also not very accurate to the game... well, I can't say that for sure, because he might have taken on a form similar to this for a couple seconds. His bottom half isn't meant to represent a robe so much as flowing molten rock, which explains the faint "cracks" on the front and back. The paint design carries that onto the black body, with red and gold painted across it suggest anatomy. 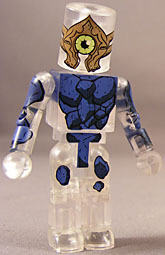 And yes, the Architect might have hair, like this Minimate does [a re-use from Ultimate Sabertooth, one of the first 2" Minimates ever --ed. ], but what I really remember - and what is missing here - are the two big horns. He has a lava blast effect that fits on either hand. While Azetlor and the Architect are a little disappointing, I like the Chef and the Slime Monster. The Chef has some of the most intricate detail work I've seen on a Minimate, particularly on the face. Again we get a tall head, with his chef's hat painted on rather than a loose accessory, and he has a "fat" torso over the standard chest. He has no legs, instead getting the same kind of clear stand used for Slimer, plugged in beneath the skirt that acts as his apron. The packaging calls him Chef DeMassi; in the PS3/Xbox version of the game, he's Chef DeForrest; meanwhile, the pared-down PS2/Wii/Nintendo DS versions call him Chef Sargossa. The Slime Monster has some nice size to him, and the hook and chain are a nice touch. None of it's new, though: the body is the Hulk movie Abomination, sans the piece to lengthen the waist, and the hook originated with DC's Lobo. Regardless, this is an overall accurate representation of the monster in the game. The game's black slime is caustic, not innocuous like ectoplasm, and acts as a connection between the real world and the spirit world. Enough of it will form a portal, and the Monster is one of the things that can come out, covered in the black slime. His head looks short, compared to the others in this set, but only because it's the normal size and completely bare. The face is really nothing but a huge toothy mouth. The basic Minimate has balljoints at the head, shoulders, and hips, hinges at the knees and elbows, and swivels at the wrists, ankles, and waist. That's great for a 2" figure. The Architect and Black Slime Monster are a bit limited by their skirt and chest, respectively, and the Chef, well, he ain't got no legs. My feelings about the videogame set are a bit mixed. Something about the set seems a bit rushed to me, like they just took whatever parts they could find from other Minimates and threw together the four ghosts the best they could. The Chef came out looking great, but Azetlor and the Architect are gigantic bad guys shrunk down to a tiny scale. 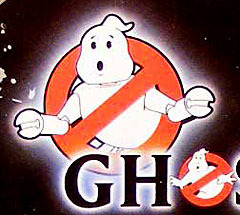 There are other, non-boss ghosts in the game that might have made for more fun Minimates, such as Stay Puft's "Marshmallow Minis," the Shandor gargoyles, the smaller black slime critters, or any of the humanoid ghosts. Even the Spider-Woman (in her pre-giant-spider form) might have been cooler than Azetlor. Again, how much you agree with this review is going to depend a lot on your feelings toward Minimates, which seem to very much be a love-'em or hate-'em thing for most collectors. While I don't see myself going out and buying any other of the current Minimates lines, I'm quite happy with these (particularly as they're almost perfectly in scale with my 18" NECA SPMM). This set was originally announced as an Amazon.com exclusive, to be sold in a high-end collectors' bundle with the videogame and a few other things. Eventually the Minimates were dropped from the set, and the price lowered, so this set made a last-minute appearance at SDCC '09, before being listed in Previews for anyone to order trough their comicshop. I enjoyed Series 1, am looking forward to Series 2 and am curious to find out who's in Series 3 - I'm hoping for Walter Peck, Vigo the Carpathian and at least a couple Ghostbusters with the slime guns from the second movie.